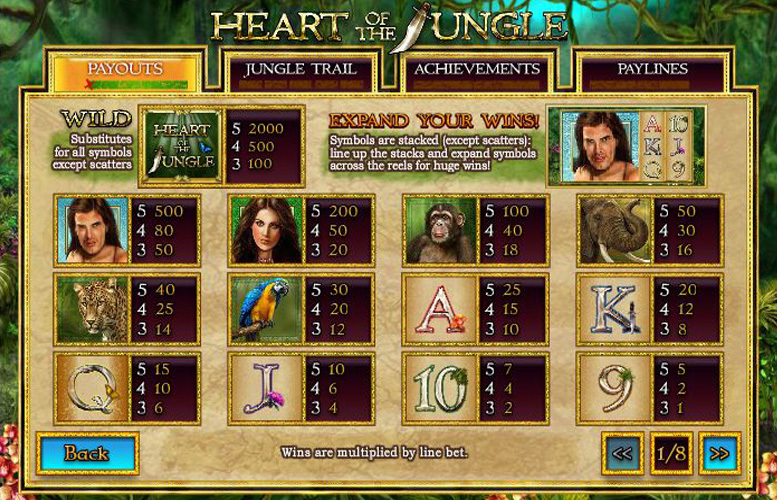 One of Playtech’s most innovative online machines on the market today is the Heart of the Jungle slot. In the game, we join a damsel who is lost in the jungle, and her saviour – a loin clothed savage that clearly takes inspiration from Tarzan. Playtech’s creativity as slot designers really shines in the title, and their addition of achievement lists and cumulative bonus features add a huge amount of “replay factor” to the Heart of the Jungle slot machine. It’s a five-reel game, with three rows of symbols. As mentioned, the bonus rounds are excellent, and make for a constantly evolving, and fresh gameplay experience. With free spin multipliers potentially as high as 25x, the machine is also more than capable of delivering a huge pay out too. Up to a massive fifty pay lines. When set to maximum, this makes for a substantial number of chances to win. There are options to set the number of coins wagered per line, and the value of each of your coins. This means there are loads of different ways to spread your money across the lines. The creative approach to bonuses taken by Playtech provides challenges, and milestones for repeat players. This novel take on features means there is greater potential longevity in the gameplay experience. The regular game prizes are somewhat on the small end of the scale. Hitting big five-of-a-kinds here won’t pay as handsomely as some other machines. If you’re not a regular player, it’s not actually possible to enjoy some of the features of the slot. 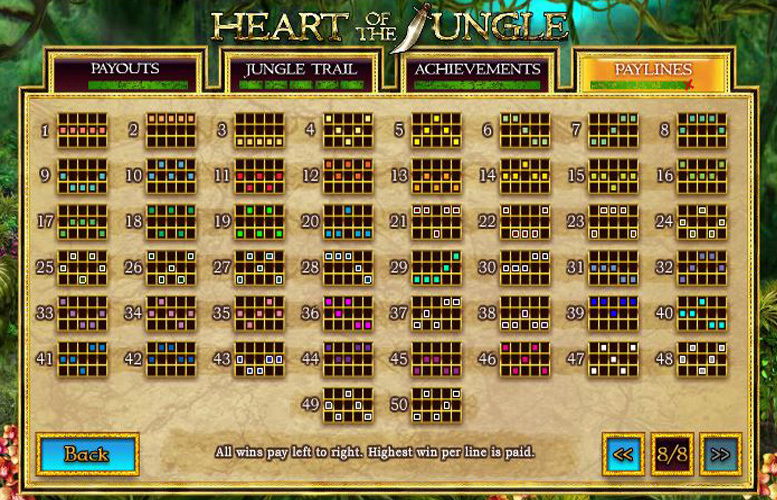 As mentioned, the real prizes in the Heart of the Jungle slot are awarded for the impressive bonus rounds on offer. The 25x multiplier that accompanies some of the features can send your winnings skyward quickly. 2,000 coins for “wild” (Heart of the Jungle) symbol. 500 coins for the jungle man. 200 coins for our jungle heroine. These are nowhere near the five-of-a-kind prizes for some other machines but hitting five “wilds” at the maximum bet of £5 will still bag players a tidy £10,000. While it may be a little underwhelming in terms of the value of specific symbols, Heart of the Jungle really comes into its own when it comes to its bonuses. There are a few different rounds here, and some additional features that really increase players’ gameplay experience. The Jungle Trail bonus feature is a great take on the classic “free spin bonus” that is common on many slot machines. Landing the tribal shield (Scatter) symbol on reels 1, 3, and 5 will initiate the round, and the perks associated with it gradually become more enticing the more times you are able to play the feature. The premise of the bonus is a journey through the jungle. Each subsequent bonus round that you’re able to partake in takes you deeper into the rainforest. The first time the bonus is triggered, the round is hosted in the “Deep Jungle” with eight free spins, plus an ultra-spin (with potentially a 25x multiplier on winnings). The fifth time the player activates the round, they are taken to “Crystal Falls” where they receive 10 free spins, and four stacked wilds. The tenth, and fifteenth time also feature different cumulative rewards, taking players to “The Golden Mountain” and “Lost City of Zantar” respectively. As mentioned, continually playing Heart of the Jungle leads to bigger and better rewards for the player. There’s a list of 64 in game achievements that players can work through. These can be basic tasks such as reading the full story for a prize, or more luck based – completing the entire jungle trail. Some of the prizes for the hardest achievements are epic too. Take the 100,000 bonus games reward as an example of such. 50x coin value for the elephant. 40x coin value for the jungle cat. 30x coin value for the parrot. 25x coin value for Ace. 20x coin value for King. 15x coin value for Queen. 10x coin value for Jack. 7x coin value for 10. 5x coin value for 9. With a massive 50 potential win lines, and a choice of between one and ten coins to stake per line, the maximum possible bet with the coin value set to £5 is a costly £2,500. By contrast, the minimum bet would be one line, one coin per line, and 1p a coin. This makes the minimum bet per spin a miniscule 1p. 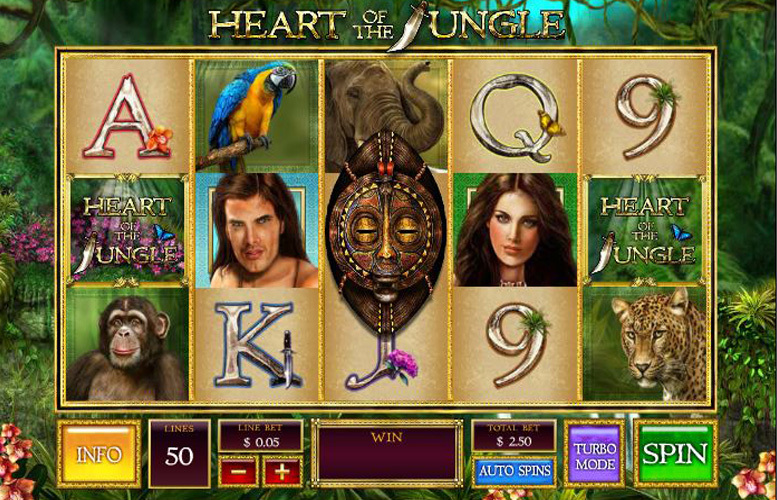 If you’re looking for some innovative slot design, a stylish looking machine, and plan on revisiting the same game several times, then Heart of the Jungle is likely going to be the slot for you. It may suffer a little from low value symbols but when the big rewards start piling up, so too will the big wins. This game has a rating of 5 / 5 with 594 total reviews by the users.